As though rock climbing weren’t exciting enough, AR is now being used to turn it into a kind of video game. Indoor climbing company, Brooklyn Boulders, has now launched a new type of augmented reality experience that allows its customers to turn their regular bouldering challenges into an entirely new competitive video game experience. 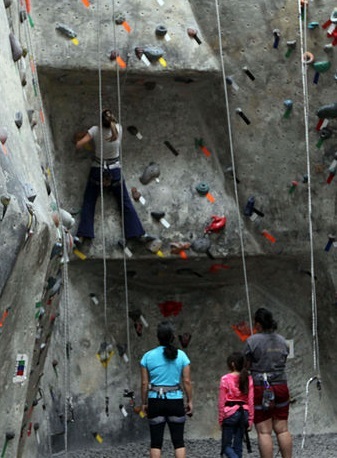 The sport of indoor rock climbing has been spiking in popularity and businesses are working to stand out. As climbing gyms start to appear all across the United States, it is reaching the point that these companies are starting to need to work to allow themselves to stand out from the competition. In this effort, Brooklyn Boulders – located in New York City – has become the first in this industry to implement an augmented reality technology based game on their bouldering wall. The hope is that by adding a lit up, competitive game experience similar to video gaming, it will help to make this sport even more appealing and will draw people specifically into their location. The augmented reality climbing game experience was first created by John Cheng and is called Time Trial. Time Trial is a form of digital AR climbing game from the Randori startup. The game works by projecting numbered circles next to the hand hold positions on the various climbing walls. When a climber touches those circles, he or she gains points. The purpose of the game is to be able to collect all the available points throughout the length of a climb. Moreover, the climber must complete the bouldering challenge within the shortest time possible. In order to run the Time Trial system, the equipment needed includes a laptop to run the program, a camera sensor, and projectors. Cheng, a former student of computer science, is a Brooklyn Boulders member and originally demoed his AR game, last year. Since it was first showcased, Time Trial has gone through additional evolution as it can now display the scores and times of the climber on the wall next to the number targets. Cheng is now working to implement the augmented reality climbing experience at locations outside of Brooklyn Boulders and is currently looking into opportunities in Queensbridge and Chicago. This new mobile game will come from Magic Leap, at a time when many thought it might not arrive. Magic Leap, an augmented reality company backed by Google, has now released a video that suggests that it will be producing a much awaited steampunk shooter game, despite the fact that it had appeared that it was withdrawing from public sight, for a while. The company had been stepping back from public appearances for a while, leaving some to build doubts. For example, earlier this month, the CEO of Magic Leap, Rony Abovitz, had been slated to make an appearance at TED in order to discuss the work at the augmented reality company, which is always held behind a veil of secrets, as a policy. At the last minute, Magic Leap withdrew from that and all of its other public appearances without giving any explanation for having done so. As of the time of the writing of this article, the company still hadn’t provided an explanation for its actions, but it did release the video that was supposed to have been shown at the appearance. This video showed a steampunk shooter based mobile game that uses augmented reality as a part of its experience. Andy Fouché, the PR head at Magic Leap, wrote that “This is a game we’re playing around the office right now (no robots were harmed in the making of this video).” That represented the most detail that the public has received about an actual project being created by Magic Leap. This mobile game has familiar Dr. Grordbort branding, a line of guns in a kind of steampunk style, comics, and a range of other products. Dr. Grordbort was first created by a Weta Workshop artist. That workshop has been partnered with Magic Leap for some time now, and its branding also appears within the video. The concept of this mobile gaming experience pretty much boils down to an augmented reality robot-shooter in which actual decorative guns are converted into “working” weapons in the digital reality. They are aimed at virtual enemies that appear as projections within the actual physical space around the player. The video also revealed a number of other images of the Magic Leap interface, which included a range of different floating components such as YouTube videos and Gmail icons.